An Aroostook County Sheriff’s Deputy arrested two Patten residents Sunday following an altercation. SHERMAN, Maine — An Aroostook County Sheriff’s Deputy arrested two Patten residents Sunday following an altercation. Around 10 a.m. Sunday, Deputy Rick York was patrolling the Golden Ridge Road in Sherman when he spotted a woman he believed to be wanted on an active warrant for an unpaid fine. Deputy York approached the woman, Cynthia Burley, 38, of Patten, who was walking on the Golden Ridge Road with Caleb Trembly, 29, also of Patten. When York approached the couple, Burley gave him a false name despite repeated attempts by the deputy to confirm her true identity, Sheriff Shawn Gillen stated in a press release. “The deputy, being familiar with Burley, tried to confirm her identity, but Burley continued to give a false name,” Gillen stated. When York was finally able to confirm the woman’s identity, her walking partner became confrontational with the deputy and tried to interfere with the deputy taking Burley into custody on the warrant, according to police. After a brief struggle, York was able to place Burley into custody. He also arrested Trembly, charging him with obstructing government administration. In addition to the warrant for unpaid fines, Burley now faces new charges of failure to give correct name, refusal to submit to arrest or detention and violation of conditions of release. 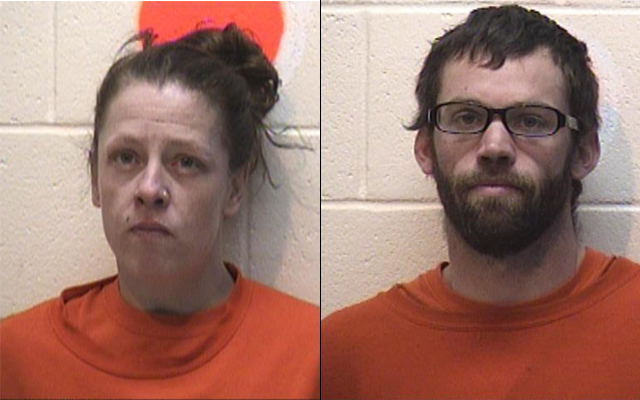 Burley and Trembly were transported to the Aroostook County Jail for holding. Deputy York was assisted on scene by Trooper Caleb Adams of the Maine State Police.